UM student John Stitt lost the lower part of his leg in a motorcycle accident in 2013, but that hasn’t stopped him from training for and competing in strongman competitions. Stitt, a criminal justice major at the University of Mississippi, began training for strongman competitions in 2012. A year later, he competed in his first event and came in dead last. But he still loved it. In November 2013, his training came to an abrupt halt. Just two days after his 23rd birthday, Stitt was in a life-changing motorcycle accident. He broke his left femur and left arm, fractured his pelvis, and his left leg was amputated immediately below the knee. Even while lying in a hospital bed, all Stitt could think about was training again. In spring 2014, he received a prosthetic foot and began standing. A month later, he started weightlifting again. A native of Hopkinsville, Kentucky, Stitt has lived in Oxford for the past six years while pursuing his bachelor’s degree in criminal justice. 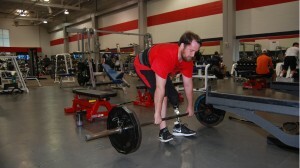 He does most of his training for competitions at the Turner Center, where he has become an inspiration for many others. Stitt said his passion for the sport is what kept him pushing through his recovery. Stitt plans to compete in another competition this August in the United Kingdom.